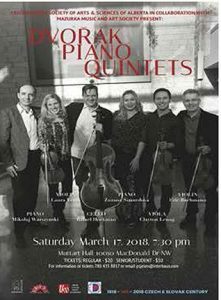 on Saturday, March 17, at 7:30 pm. at the Muttart Hall of Alberta College, 10050 MacDonald Dr.
Clayton Leung on viola, and Rafael Hoekman on cello. This concert is presented by the Czechoslovak Society of Arts and Sciences of Alberta, in collaboration with Mazurka Music and Art Society, and is a part of the concert series: “100 Anniversary (1918-2018) of Independence of Czech Republic and Slovak”.